The Locus Delicti Still Stands on Bond Street… almost! It was a chilly December day in 2001, a full year or more into my project, a day spent running hither and thither between archives and courthouses. Dusk had descended and I was headed home from the East 77th Street subway station. My route took me past a real estate office on 78th Street and Third Avenue, and by force of habit I stopped to peruse the listings of the insanely expensive dwellings offered in the show-window ads. I wonder if any of the agents saw me, standing there, nose pressed to the glass, jaw slack, mouth agape, staring at one of the properties, a small multifamily downtown, offered as an investment opportunity. My eyes fixed on an ancient three story + gables house, now cut up into apartments, offered at $4 million. I looked once, pinched myself and looked again. 26 Bond Street. It couldn’t be true. A clone of Harvey Burdell’s house. My heart stood still while I copied down the information. Dressed in shabby blue jeans and an old parka, I didn’t want anyone to notice me. I’d make a call, be an investor. Somehow I had to get inside. Frank Leslie’s Illustrated Newspaper covered the murder in horrific detail, its articles filled with engravings of the deceased, the accused murderess, and many other scenes. 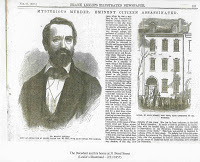 The February 21, 1857 issue shows the late Dr. Burdell, elegantly attired, next to a drawing of the facade of 31 Bond. Take a look and then look at the photo I took in late December 2001. The two houses are identical, save the two windows removed on the first floor of 26 Bond when the storefront was installed. I had to get in, no matter what it took. Servant boy John Burchell went about his early morning tasks when he arrived at 31 Bond on the morning of January 31st. One of the first was to haul scuttles of coal to the fireplaces on each floor of Harvey Burdell’s home. When he reached the second floor, where the dental clinic was located, John noticed something amiss: the key to Dr. Burdell’s clinic was hanging on the outside of its door into the corridor. When he jiggled it, the door gave way. There lay his employer, in what one newspaper reporter described as “perfect pool” of gore. The stairwell of 31 Bond quickly filled with screams: his, cook Hannah Conlon’s, and then poor Emma Cunningham, apprised of the death of her would be husband. I made a date with the real estate agent to go and inspect my new potential investment. After making small talk outside, we entered with her pass key. I almost fainted when we stepped inside. Though the rooms on each floor of 26 Bond are totally altered from their original state, the main stairwell is totally untouched. Take a look at the two photos below. Though this stairwell is curved (as opposed to the linear layout that one infers from the floor plans published in the early February 1857 articles in The New York Herald) it may well depict exactly what servant boy John saw as he made his rounds that cold January morning 150 years ago. Down such a winding, treacherous set of landings he flew out that door to get the police. At the top of the stairwell lie two gabled rooms, tiny and stuffy, they probably housed servants at 26 Bond. The skylight crowning the top of the stairwell is also untouched from its c. 1825 form. The final photo shows the detail, a graceful fillip from these houses’ halcyon days.